BMW Motorrad Rider's Equipment 2016. BMW Motorrad dealers are kicking off autumn with a fantastic offer of a complimentary pair of gloves with every purchase of genuine BMW Rider Wear with a value over $1,000. BMW Motorrad Australia is pleased to announce the arrival of the all new motorcycling jackets designed and made by British clothing company Belstaff and is available exclusively through Southbank Motorcycles in Melbourne. BMW Motorrad Rider's Equipment 2014. BMW Motorrad Rider's Equipment - 2014 Collection. The BMW S 1000 RR continues to impress everyone who rides it, winning almost every comparison test since it was launched in 2010, including its 3rd AMCN Austest award in 4 years. BMW Motorrad gears up for summer: unprecedented value deals on rider equipment. BMW Motorrad Australia today announced a limited-time special offer on all Riderwear in preparation for a great summer of riding. BMW Group Australia releases advanced premium Enduro Helmet. BMW Motorrad Australia today announced a new range of exclusive and luxurious rider equipment, available now for sale from BMW Motorrad Dealers nationally. BMW Motorrad Rider Equipment 2009 - innovation and functionality. 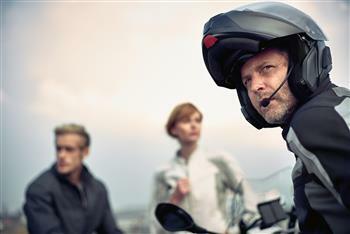 BMW Motorrad is pleased to introduce the new Rider Equipment ranger for 2009. Streetguard 3 suit - comfortable all-rounder. Proving that form, function and great design can work together in harmony, the Atlantis 4 suit from the BMW Motorrad rider equipment collection has been awarded the renowned iF product design award 2009 by an international jury. BMW Motorrad Rider Equipment - Product Innovations 2008. Trendsetting Technologies and Modern Design Continue the Success Story. The innovative and exciting 2007 BMW Motorrad Rider Equipment Collection is now available from BMW Motorrad dealers across Australia. Available in unisex sizes S to XXXL, the new Enduro Trousers are ideal for riding off-road.